The STYLISTIC Q550 is distinguished by usability features such as full work day battery runtime and a brilliant anti-glare 10.1-inch screen that allows for use both indoors and outdoors. Along with excellent ergonomics, Fujitsu makes mobile data entry easier by combining a multiple touch interface with precise and pressure-sensitive pen input. The STYLISTIC Q550 automatically recognizes when users are working with the pen, allowing them to rest their hand on the screen when writing. Built-in handwriting recognition software converts input to text. When the pen is not in use, the slate PC automatically adjusts to a touch interface. Microsoft welcomes the release of the STYLISTIC Q550. Windows 7 is a great choice for commercial customers looking for a devices that enables the flexibility and mobility their businesses need to succeed. 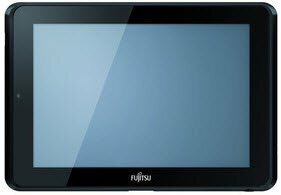 The Fujitsu STYLISTIC Q550 is provided with an array of security features such as an integrated fingerprint reader, smartcard reader, and solid state hard disk with Full Disk Encryption (FDE).